This card satisfied two cravings of mine. One to make a card with the small squares and the other to try my hand at a vellum flower. I had an EF that was of bricks, using my brayer, I applied Crumb Cake Ink to the inside and ran it through the big shot. After cutting 12 1” squares, I sponged each edge with the corresponding ink. Can you notice the extra dimension, they really stand out more. Then each square was placed on another slightly larger square using Crumb Cake card stock. The flower was created using the Blossom Punch and each ran thru the big shot with the polka dot EF. Then using your stylus, each was cupped which made the dots even whiter, placing one layer down and the other layer upwards. The Five Petal punch and a smaller flower punch gave me the next two layers. A tiny pink rhinestone topped it all off in the center. The leaves are actually silk. They are normally used in flower arrangements. They worked perfect with the vellum. Lovely card! Before I read your "recipe", I was trying to figure out which DSP you used for the small squares. Once I read the description I could see the brick. Who would have thought brick could be so pretty? I love your vellum flower also. Very pretty card, thanks for sharing. Seriously Linda....You flower is so pretty BUT....what steals the show on this card is your fabulous brick wall creation. LOVE HOW YOU DID THAT! I think the sponging you did on all the edges really brought the squares together and your card looks amaing. Many thanks for sharing with us. Your flower is gorgeous!! I'm your new follower! I sooooo want that EF!! That brick background is amazing!! I love it. Works beautifully with the delicate flower, but would be a great way to make a masculine card too! Oh my goodness - you never cease to amaze me! 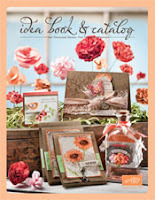 I love this idea and have the same embossing folder....have to give this a try - and that flower...wow! TFS! Linda, you have created beautiful texture with that EF, and the vellum flower just tops it off. Thanks for the inspiration. What a pretty card. I love the way you did the flower. The embossing gave it a wonderful look. Your bricks are wonderful! What a fabulous effect! And that flower is beautiful - such a craftsman you are! great job with the sketch and what a stunning flower! Wow, this is awesome Linda! I love what you did with the Brick EF, what fabulous texture! I will have to pull mine out and try that! And the vellum flower is just gorgeous, especially with the embossed dots! Very pretty card! Just beautiful! Love how you used the EB folder and the Vellum flower is gorgeous.